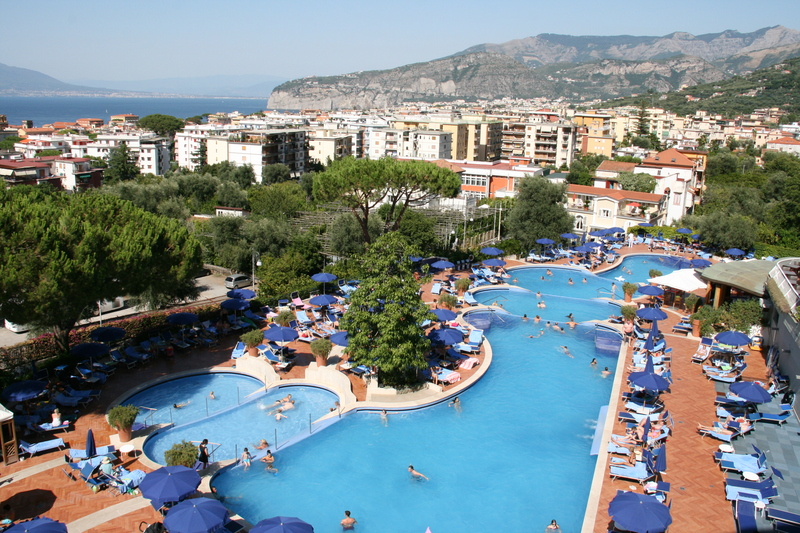 The hotel also has a great Kid’s Club with plenty of activities every day, situated right by the gorgeous multi-level pool area (again with stunning views of Mount Vesuvius), as well as a great poolside café, perfect for lunch or gelato snacks. 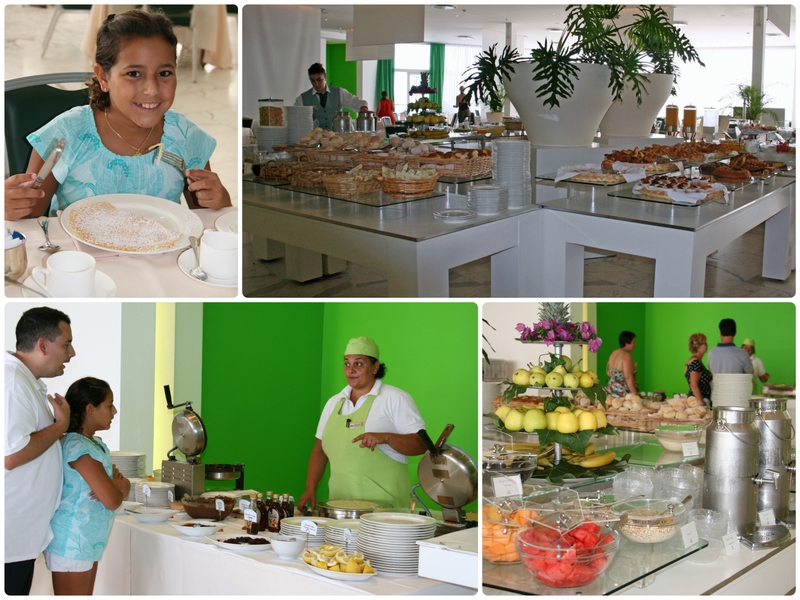 Also worth mentioning is the amazing buffet breakfast served in the breakfast room every morning. My daughter goes crazy over the freshly made crepe and pancake stations, not to mention any other item one can desire for breakfast. And last but not least is the amazingly delicious rooftop restaurant, serving some of the best dishes we’ve eaten in Sorrento, and mind you, we are not usually big on hotel restaurants. 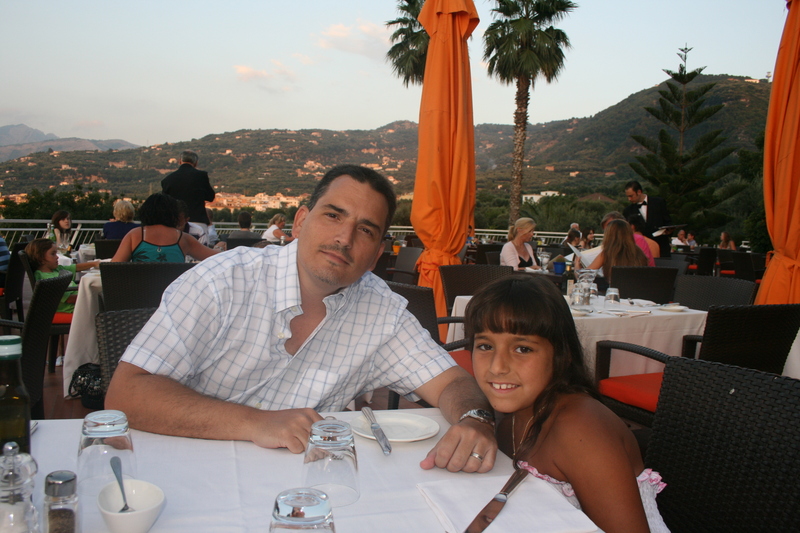 Hubby and daughter ordering their freshly made crepes at the breakfast buffet. Dinner at the rooftop restaurant of the hotel. But enough about the accommodations and let’s get to the beauty of this town. 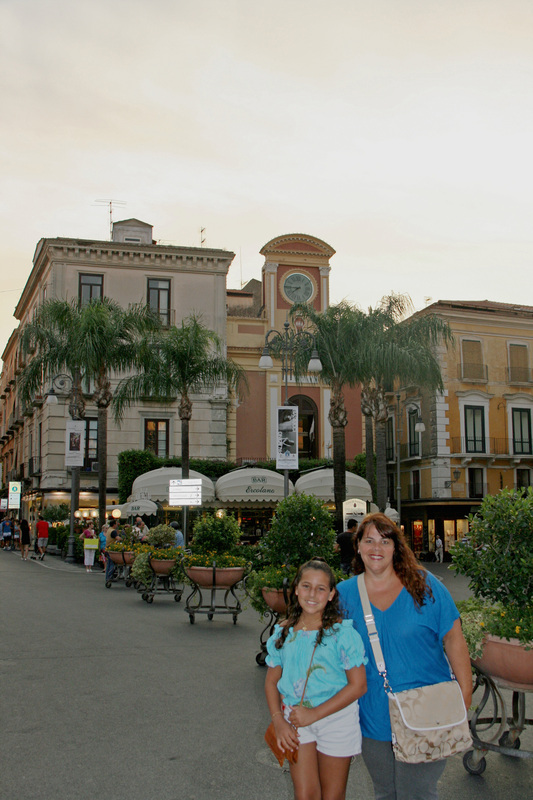 The cobblestone streets and narrow lanes that lead out of the Piazza Tasso, the town’s main square, include Via San Cesareo, the town’s primary shopping street, full of shops and cafes. If you return in the evenings, when vehicle access is restricted the central hub becomes one of the town’s most popular places for the traditional Mediterranean pastime of an easygoing evening stroll. And in typical Italian fashion, all of the stores and restaurants stay open pretty late. Also on the main square is a terrific little snack bar, Bar Ercolano, that sells the most amazing gelato, our daughter had her nightly treat at this place. 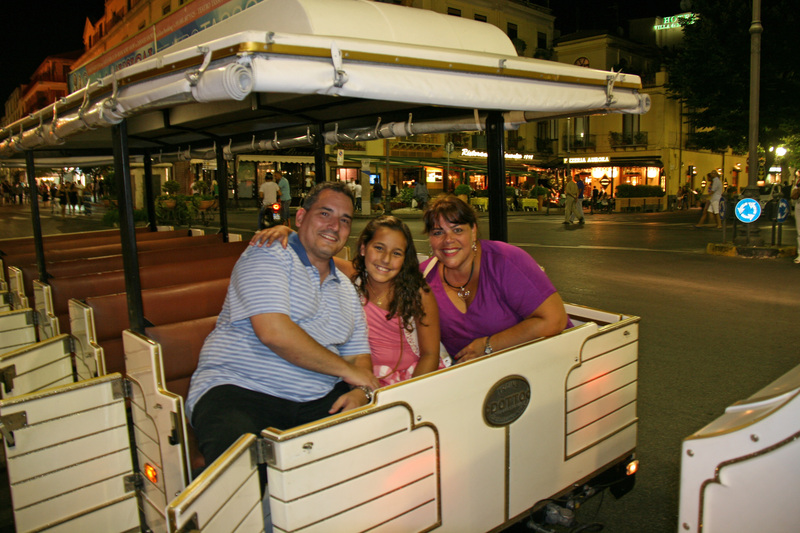 A small white tourist train (Sorrento City Train) also leaves from the square. 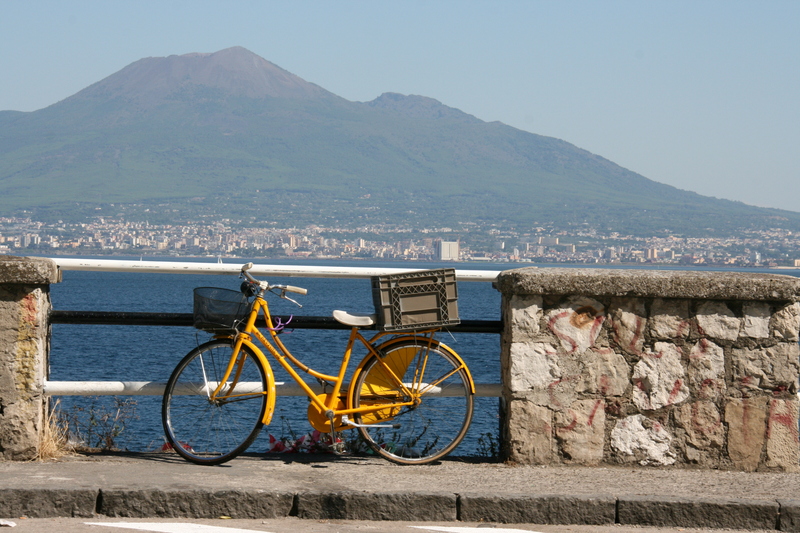 For a few euros it takes you on a 30-minute round trip through the old town and down to Marina Piccola. 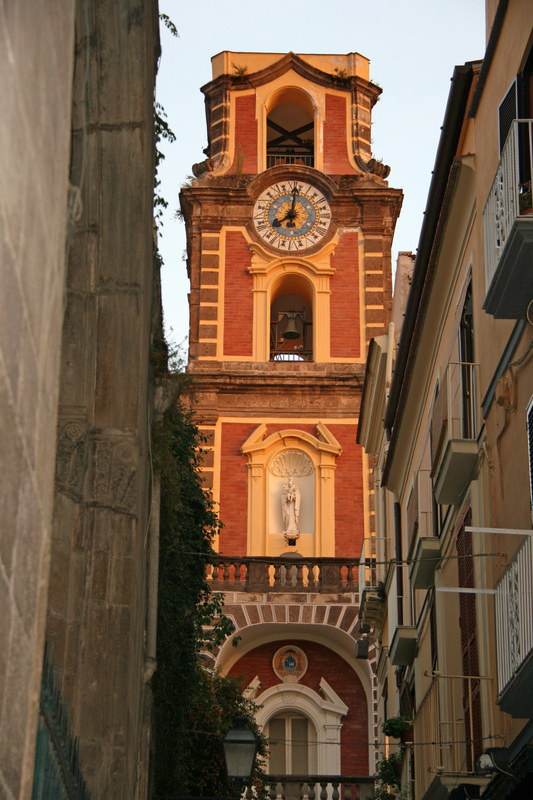 But perhaps one of my favorite sights on the square is the Baroque Church of Santa Maria del Carmine, with its beautiful yellow and white facade, stop in and take a look inside this gorgeous church. 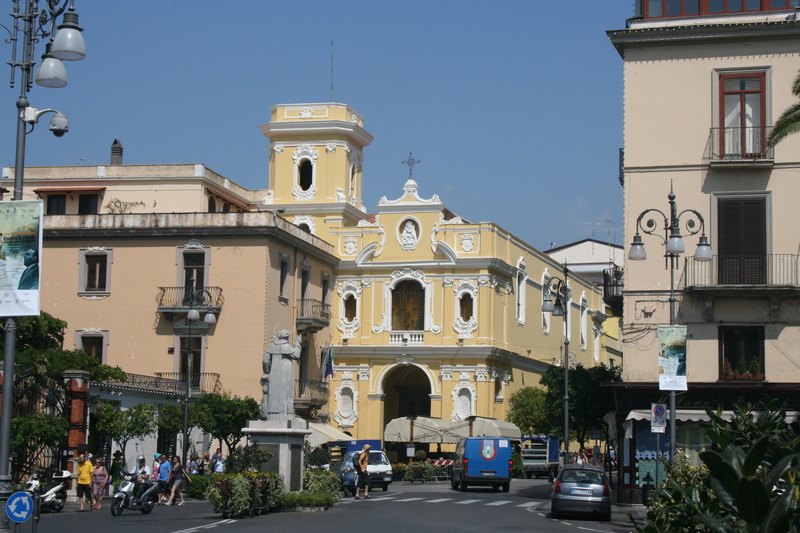 In the center of the square stands a statue of St. Antonino Abate, the patron saint of Sorrento. One of our favorite restaurants in town is the Michelin star rated Il Buco, (reservations strongly recommended). 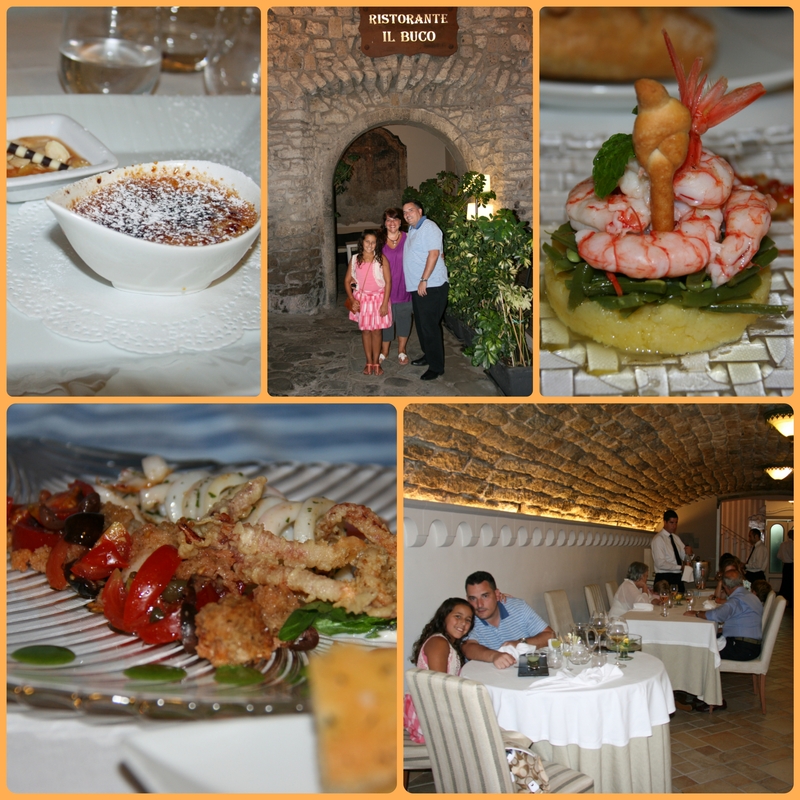 The restaurant, housed in the wine cellars of an old monastery in the center of Sorrento, has some of the best food I’ve had anywhere in Europe, not to mention some of the most exceptional service as well. The place is not easy to find, as it’s tucked away on a side street off of Piazza San Antonino, but ask anyone and they will lead you right to it. You can sit outside on the romantic cobblestone street, but we much preferred to sit in the stunning indoor restaurant, created in the beautiful, old cellar of the convent of Theatine monks, dating all the way back to 1400. The dishes rotate on a nightly basis, and if you don’t particularly like anything on the menu, (our daughter is quite picky) they will try to accomodate you by creating something special with whatever fresh pasta, fish and ingredients they have for the day. As they like to say…You are invited to discover all tastes and flavors of our tradition, reworked and revised to create exciting new experiences for the senses. The presentation of the food was also spectacular, and every meal and wine came with a perfect explanation of its components, ingredients and where it came from. Oh and make sure you leave room for the delectable desserts. Needless to say, we went back for a second meal. 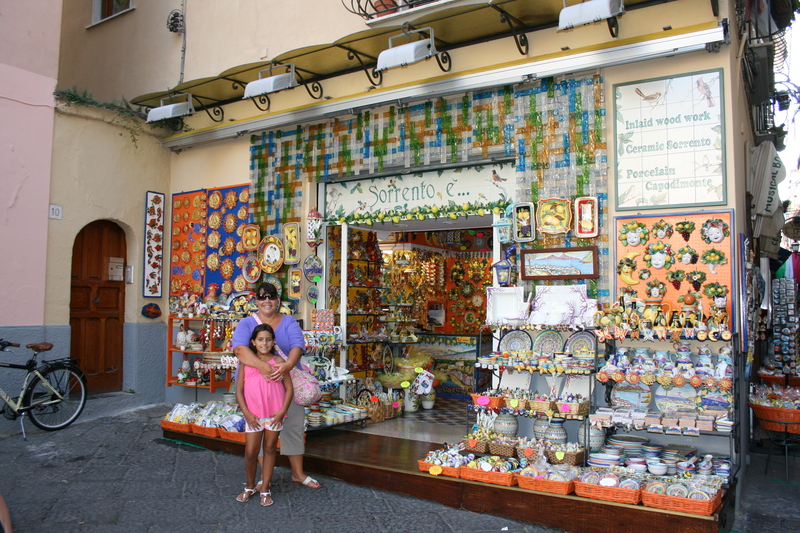 You will find many types of shops in Sorrento selling leather sandals, ceramics, limoncello and soaps, all sorts of goodies. 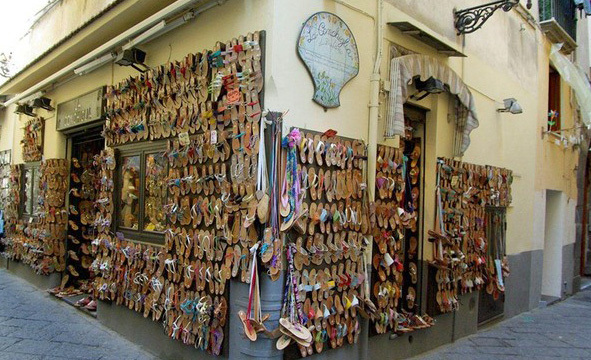 One of our favorite leather shops is La Conchiglia, where you can have your sandals custom made while you wait. 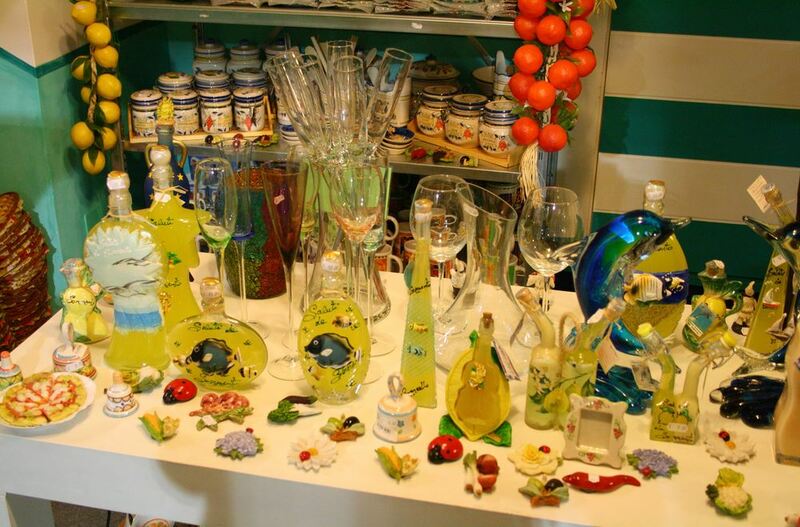 Take your time and stroll through the town and I’m sure you’ll find something you like. 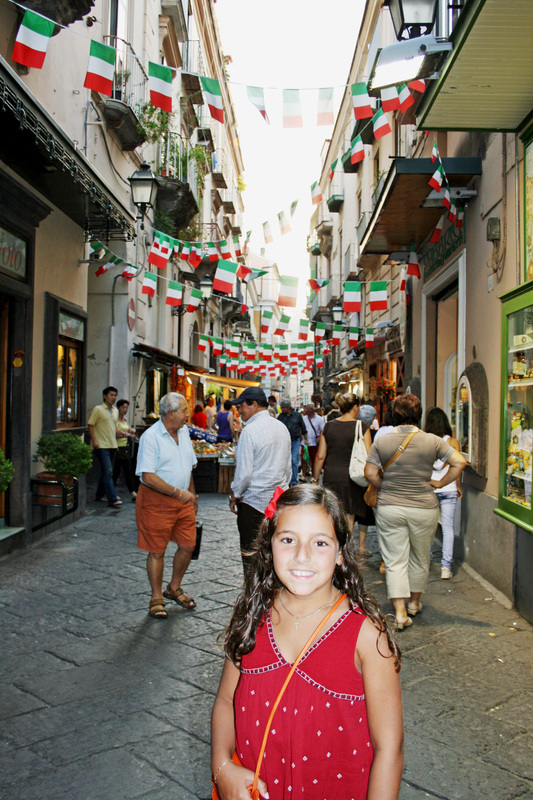 Sorrento is also a great place to take day trips from, especially by ferry. 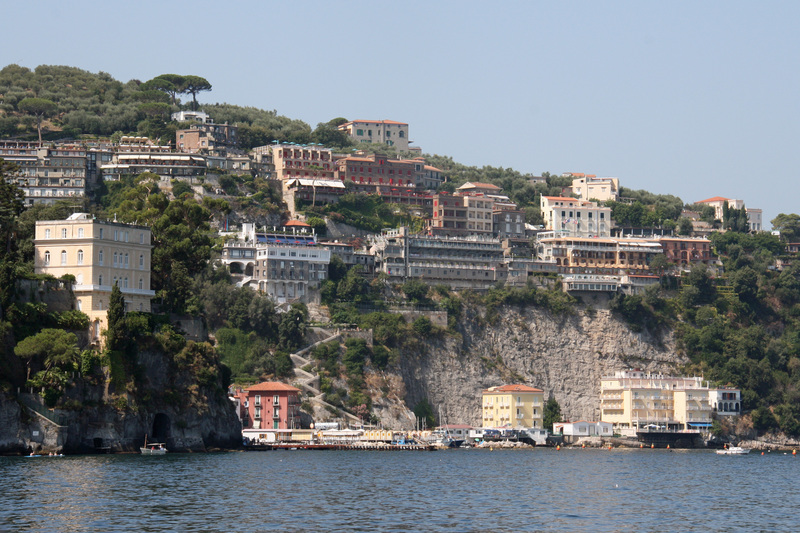 You can take a boat to Positano, Amalfi, Capri, and many other Amalfi Coast towns. THAT POOL! Seriously that looks like such a beautiful place! 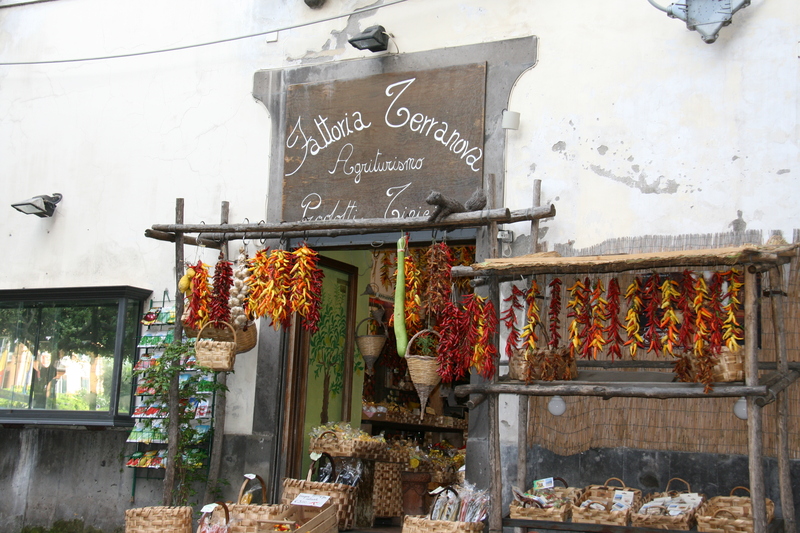 My husband is a travel addict as well & I think he is going to love Sorrento just seeing these fabulous pictures. 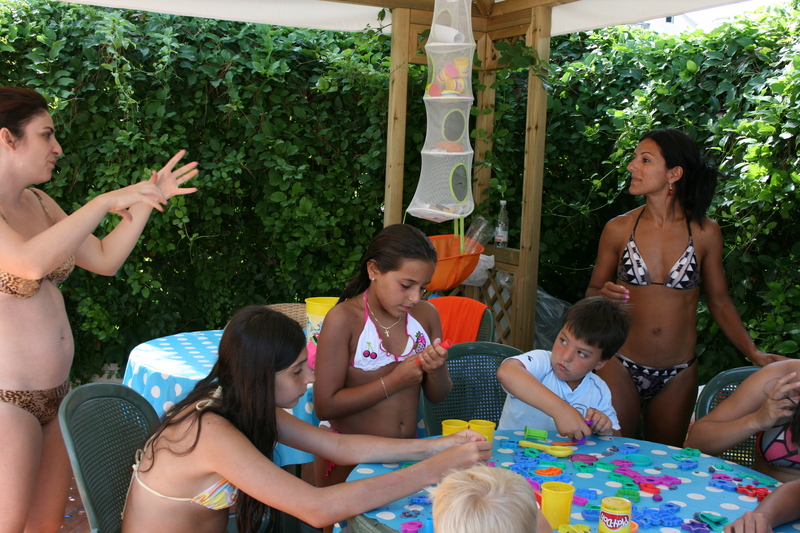 I am sure you had a great time with your family. I love the Bell Tower & that beautiful view from the top of your room balcony, just amazing. Oh what an absolutely beautiful place to go on holiday. I love the look of the old buildings and that pool looks amazing! Your view from the hotel is gorgeous – there’s so much to take in. 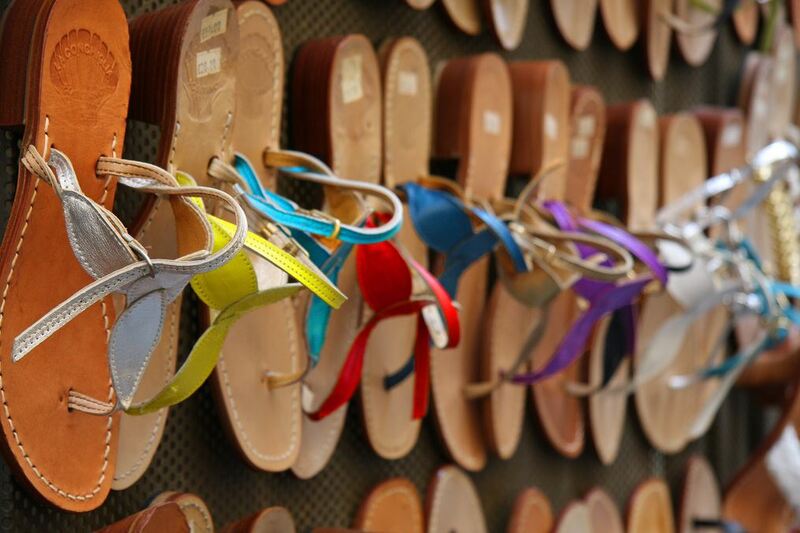 The lemon shop and leather sandal station is sooo cool and colorful. 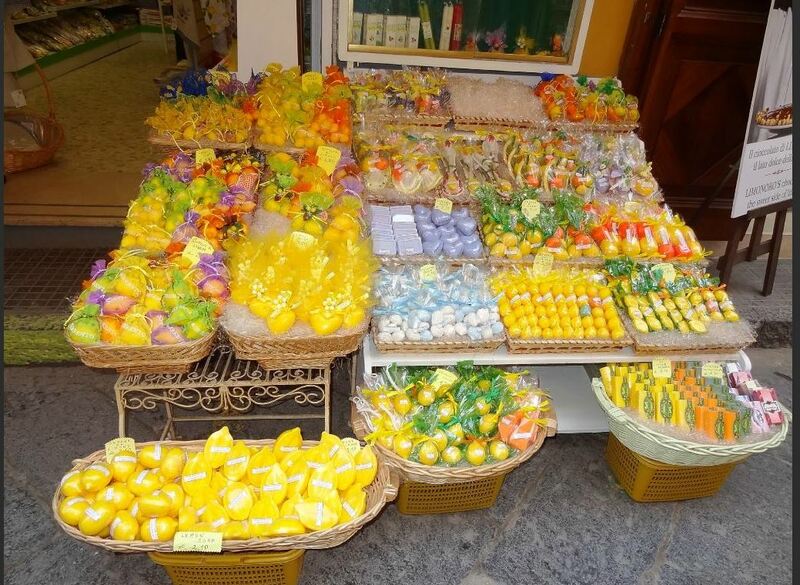 I would love to explore the different food in Sorrento. 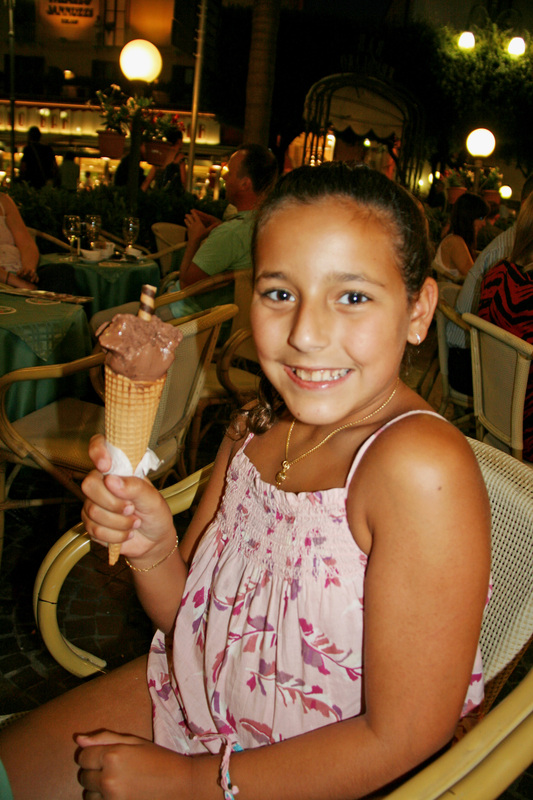 And look how large the gelato cone is – I’d be in heaven. I can only hope to visit one day. It is certainly on my bucket list. It is beautiful! This reminds me a lot of Amwaj Island in Bahrain. It has that same feel, and it makes me miss it. It looks like a lot of fun and I want to visit! 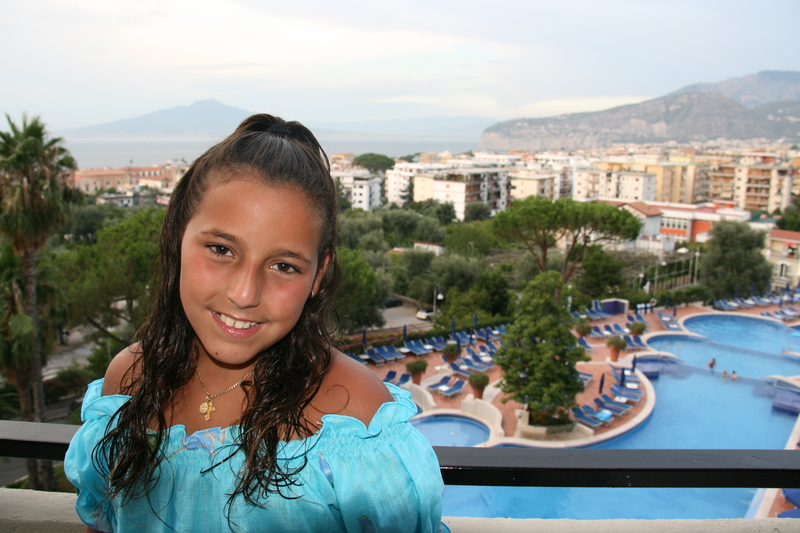 Looks like you had a great time in Sorrento! I haven’t been there but I’m adding it to my list of places to visit. These are great photos! I wish my fam. could visit also these places one day.